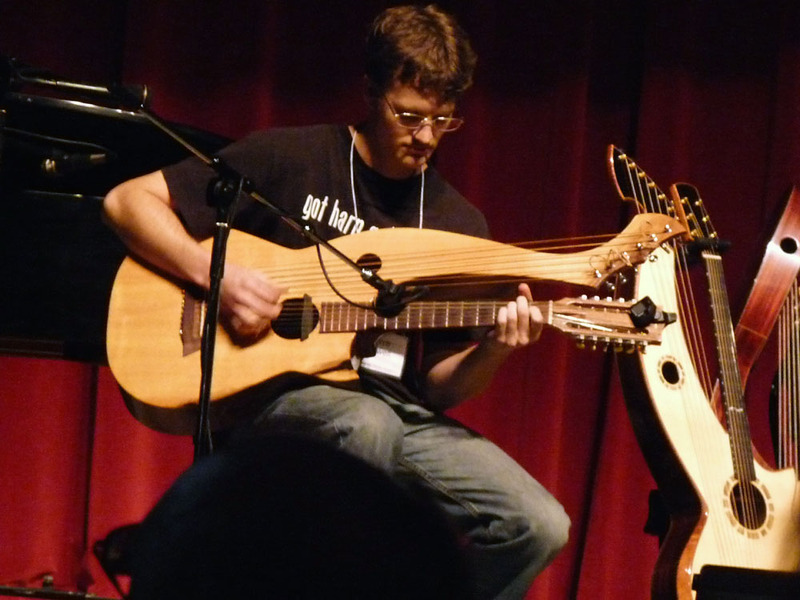 We had another great showing of some wonderful instruments, including several “firsts”! 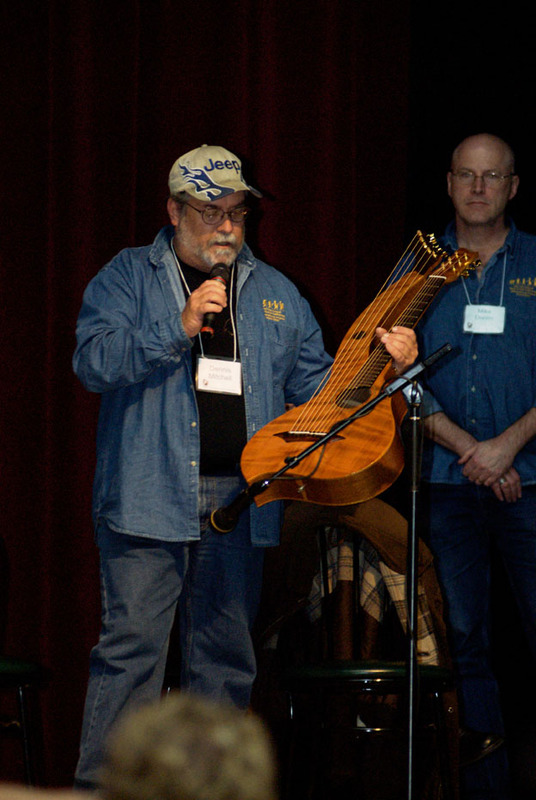 This year’s panel was hosted by Benoit, who had two harp guitars with him – last year’s steel-string instrument with that wonderful original design (he left this with host Brad Hoyt, to have available for sale in the States), and this year’s new double-neck with custom silk & bronze strings. 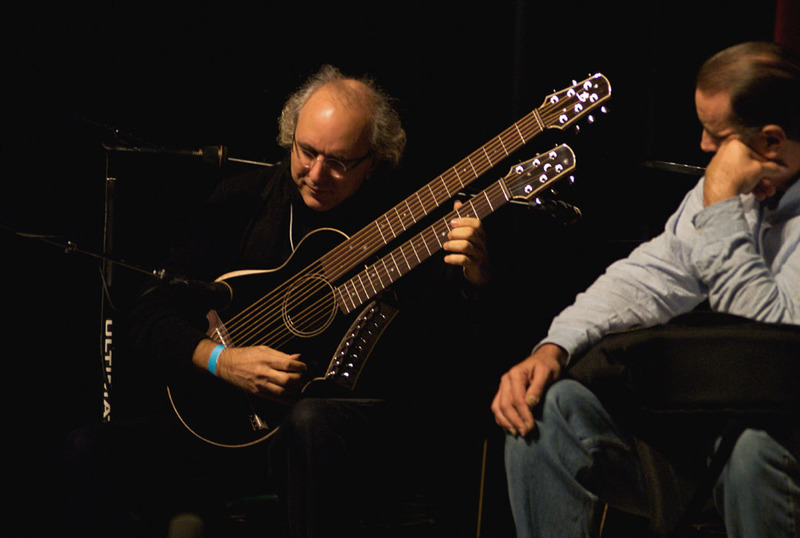 This is the instrument he loaned Muriel Anderson while in Europe – she used it on the tour with Tierra Negra and also on their recording. 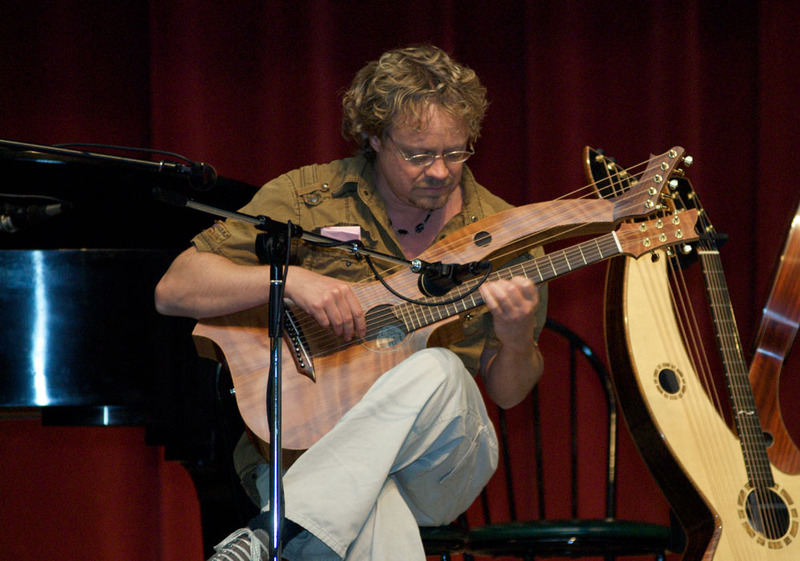 Jim Worland had two typically unique instruments this year – an electric with subs and supers, shaped something like a Flying V (already sold), and a new instrument for previous Worland customer Ed Dowling. 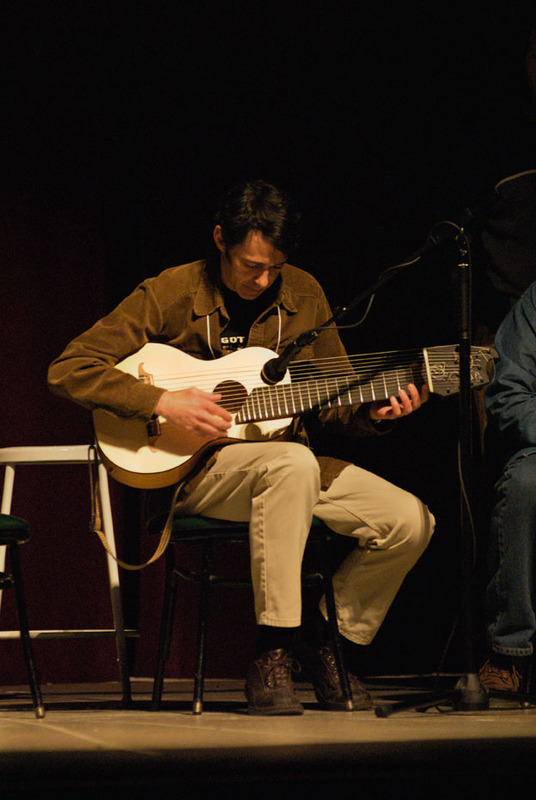 This 13-string was a more modern variant of the nylon-string arch-guitars played by James Kline. Ed even tunes his basses in a strange, Kline-inspired re-entrant tuning. I really liked the sound on this one. 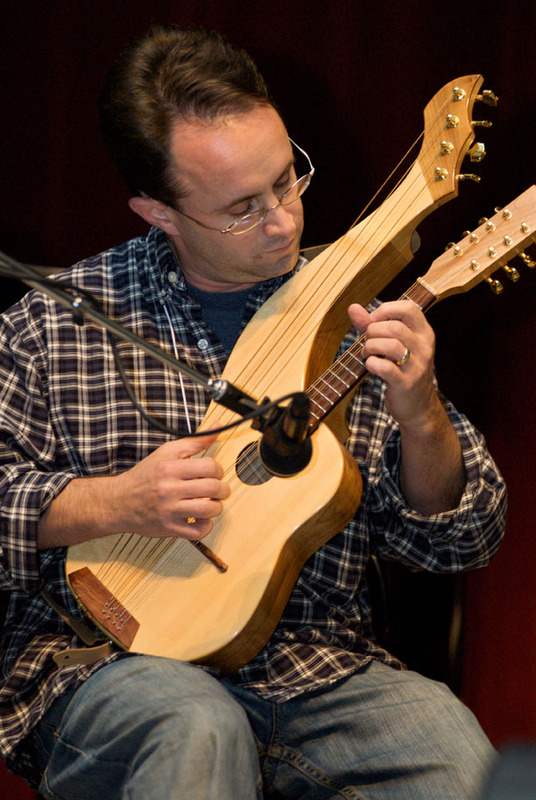 Duane Noble had another typically flawless harp guitar, a standard Noble with Indian rosewood back & sides. That shipped out direct to a new customer in Switzerland after the weekend. He had Noble-owner Stacy Hobbs demo this new one. 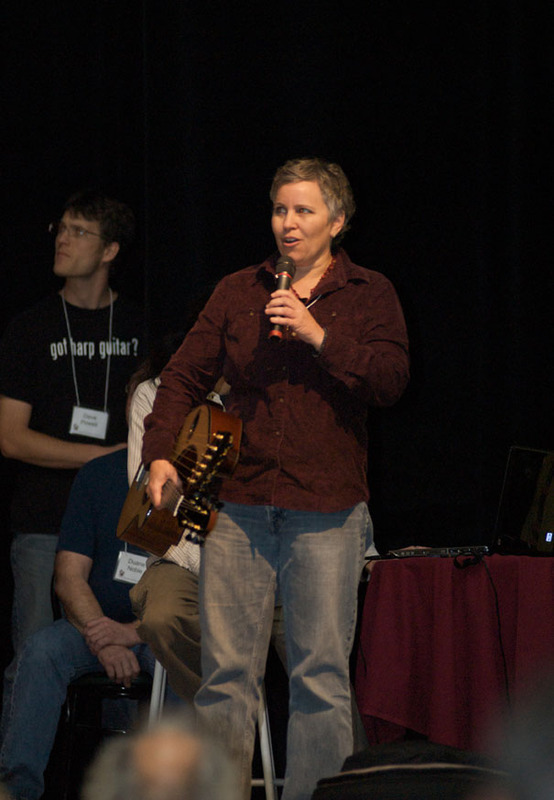 Kathy Wingert was there with Stephen Bennett’s new harp guitar (apparently she hadn’t slept in 2 weeks, working to finish it). I didn’t get a chance to compare the sound to her others (3 of which were there) – did anyone else? 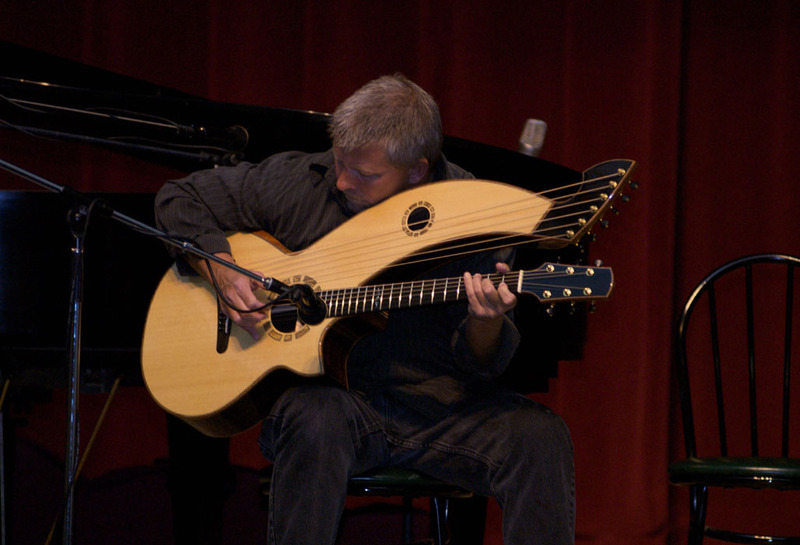 I did spend a bit of time with it at Stephen’s home last week, and heard the usual Wingert perfection. 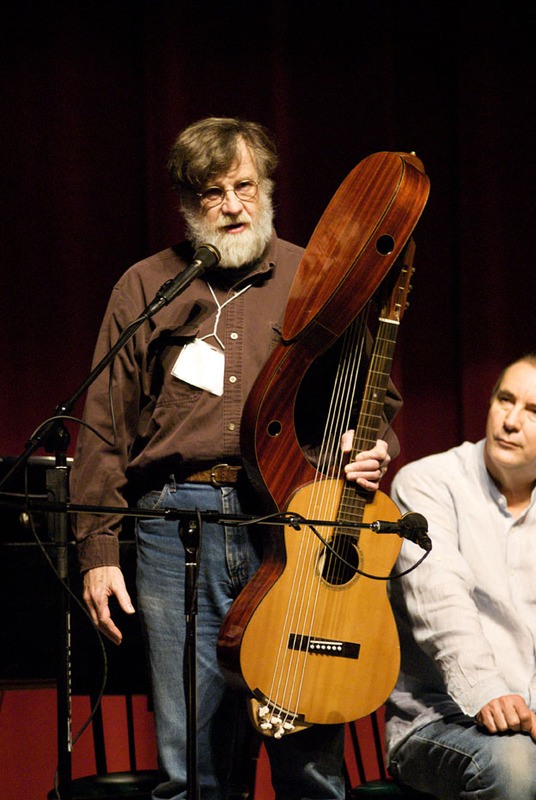 Of all the harp guitars in the house, SB and I agreed that this might now be first choice for recording. 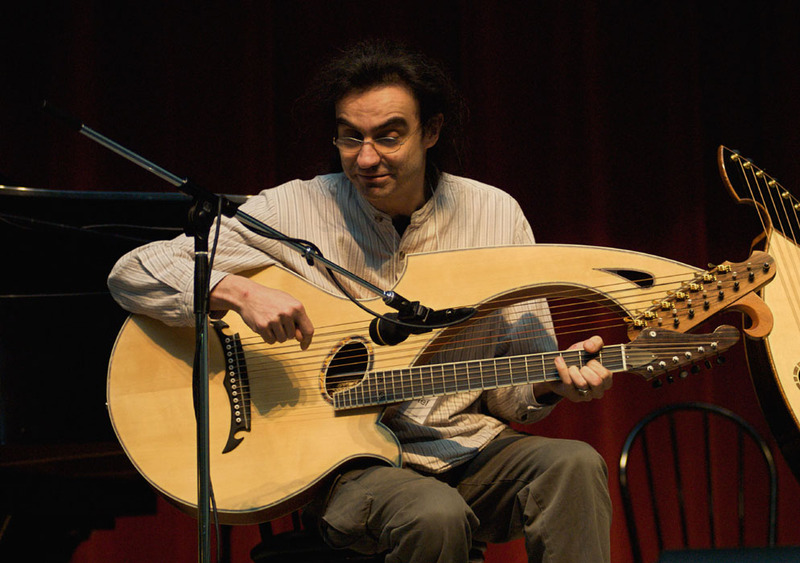 Of particular interest was the new layout and specs which put the harmonics of the subs (octaves) exactly where they occur on Stephen’s Dyer relative to the neck’s frets. I also liked the “mini-bevel” and other subtle new design elements. 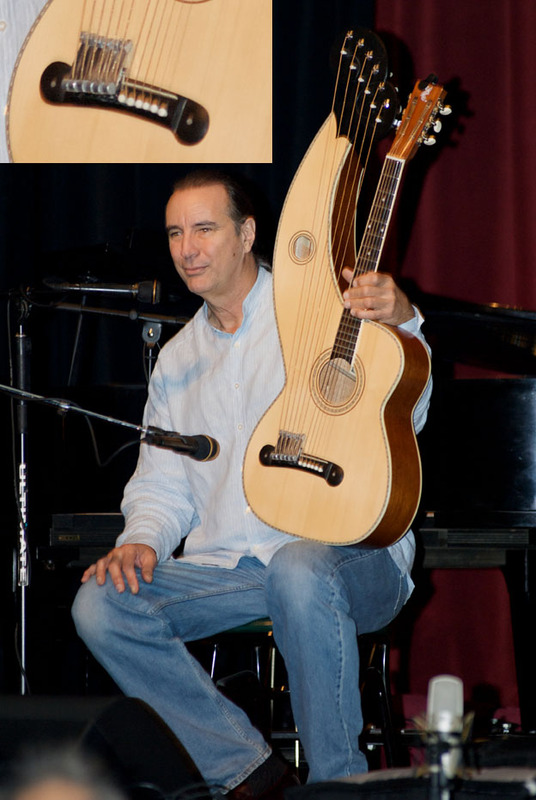 Mike Doolin did his usual captivating slide show on the building of Muriel’s latest nylon string (late 2009) with steel super-trebles. One rather striking aspect about it was the temporary foam pad Mike put under the trebles when he chasing down a buzz. It turned out to be something else, so the pad is now unnecessary – but Muriel liked the design of that stylishly-cut piece of foam, so left it in! 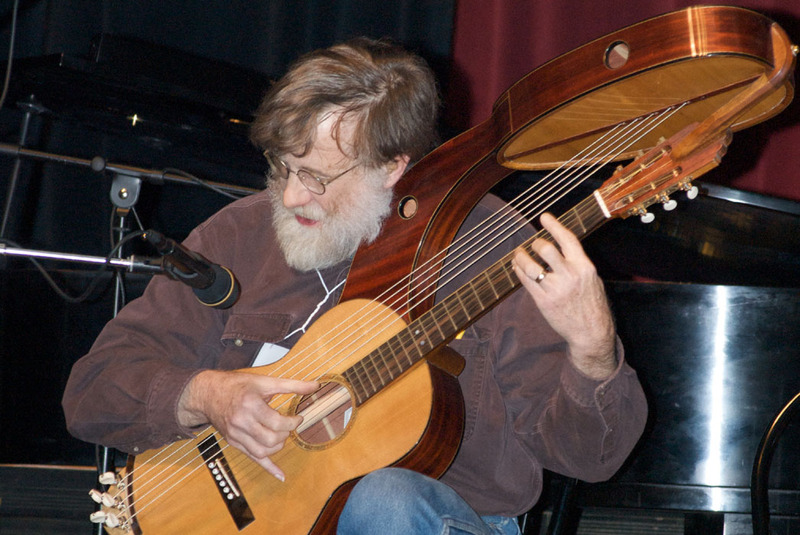 Dennis Mitchell spoke briefly about last year’s instrument, a beautiful short scale harp with redwood top, demo’d by Tom Shinness. 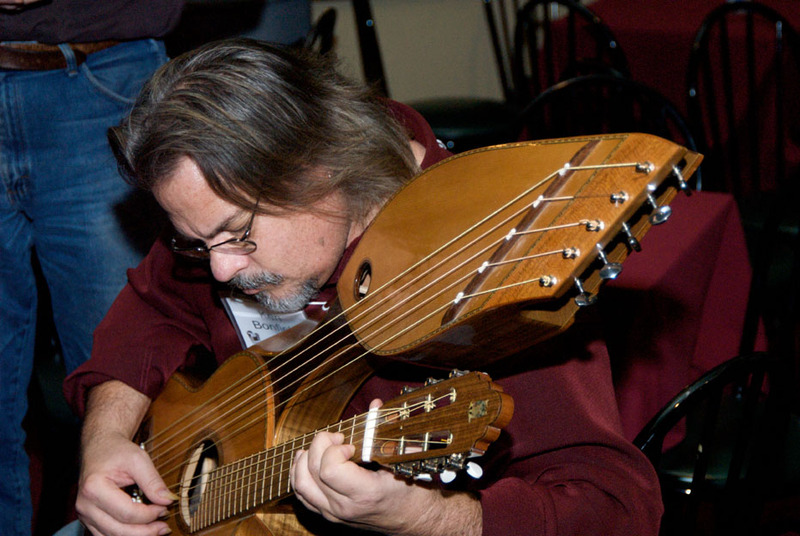 We offered John Doan an unplanned luthier spot to demo his amazing new custom Brunner Outdoor Harp Guitar (OHG) with super trebles! He literally received this in Salem the day of his departure, and with 30 minutes to try it out, made the decision to leave the Sullivan-Elliott at home. A brave (foolhardy?) snap decision that paid off in spades – the instrument worked like a dream. 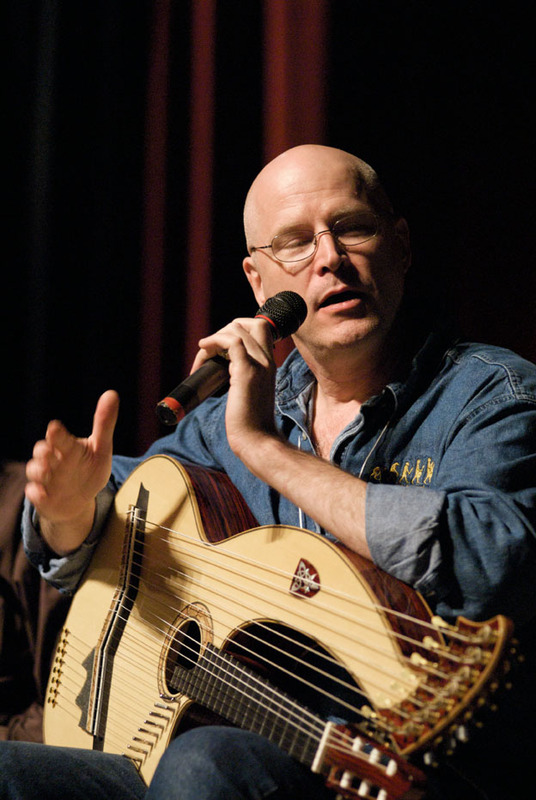 Still addressing optimum string gauges, John played it as easily and beautifully as his other. 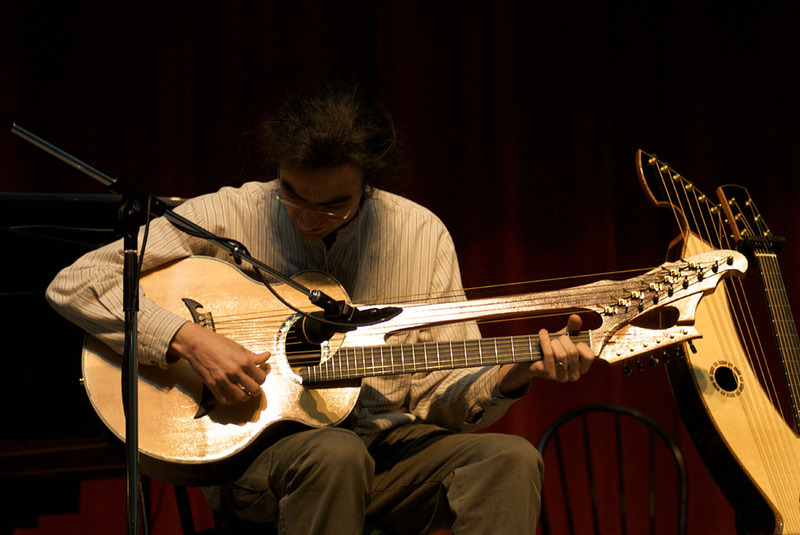 It sounded wonderful, and even had steel strings for the subs (due to locking tuner mechanics), rather than his favored nylon. The supers sounded fantastic, and I’m anxious to hear an A/B experiment with his S-E to see if the “magic trampoline top” (my words) of the Brunner truly does the same for supers and it does for subs. And it looked gorgeous in Knutsen-inspired black. But John – it’s not supposed to take two to assemble! Another surprise new invention was Andy Wahlberg’s chromatic sub-bass pitch-raising mechanical device, operated with the palm of the hand while playing. Here, mad inventor Andy demos his creation, installed on a Holloway HG. Lastly, a special treat was the first Gathering appearance by Alan Carruth (pronounced, as he explains, as in “Get in the car, Ruth”). Alan is, frankly, a national treasure, and a sort of “Fred Carlson of the East Coast” in that he is similarly brilliant and original. He and long-time client Ken Bonfield had with them the Beast and Beastess (see my blog of Oct 21). 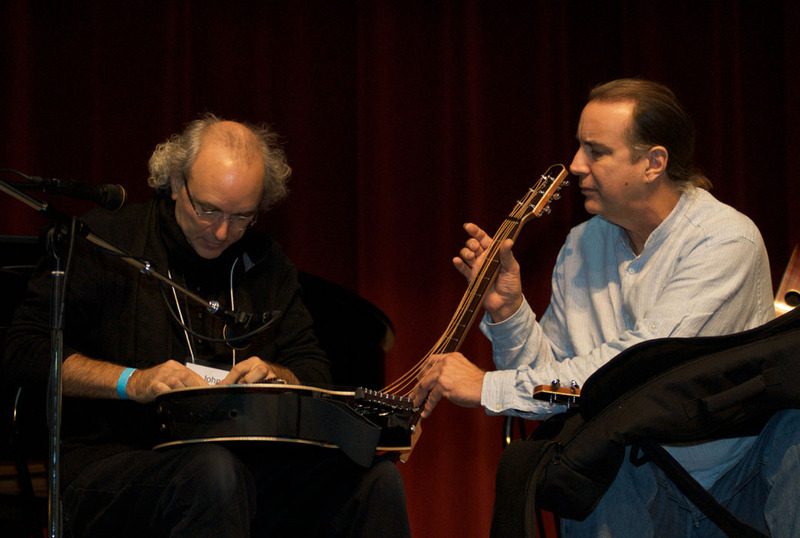 The two instruments were rarely resting, as everyone had to try them. Each one is completely unique, and also completely different from each other. I intend to create a full photo essay web article by Alan about the creation of these truly unusual and clever experiments. The Beast so far seems to defy performing for an actual audience, though the player has a blast with the full stereo separation of neck and subs. 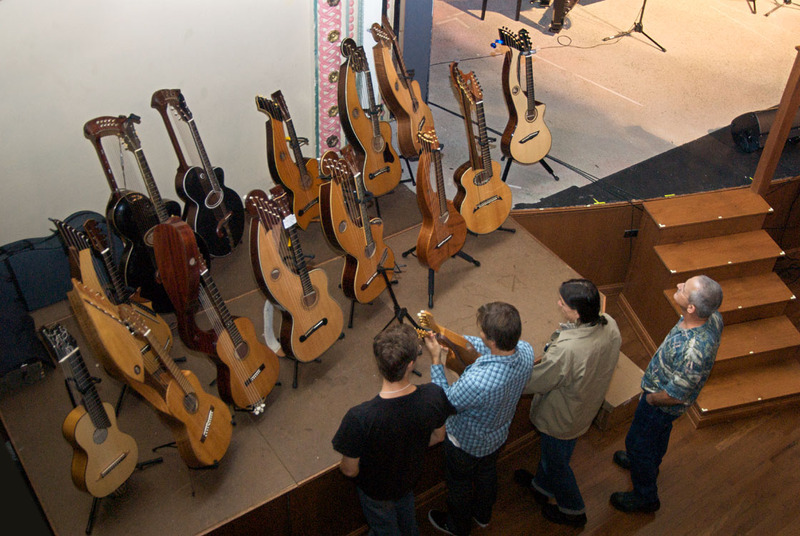 Regardless, however odd of an instrument, there was a lot of interest in giving it a permanent home. I was extremely honored to have been chosen as the new custodian, after a night of soul-searching convinced Alan to (as he said) “make you an offer I should refuse.” Much too generous, but Alan and I agreed that it seemed to be the Beast’s destiny, so I finagled a ride home for it with Jeff and Bina Titus (now I just have to get up to Marin County and collect it). After Saturday’s 2-hour panel, the builders all reconvened Sunday morning for informal Q&A and private demos. 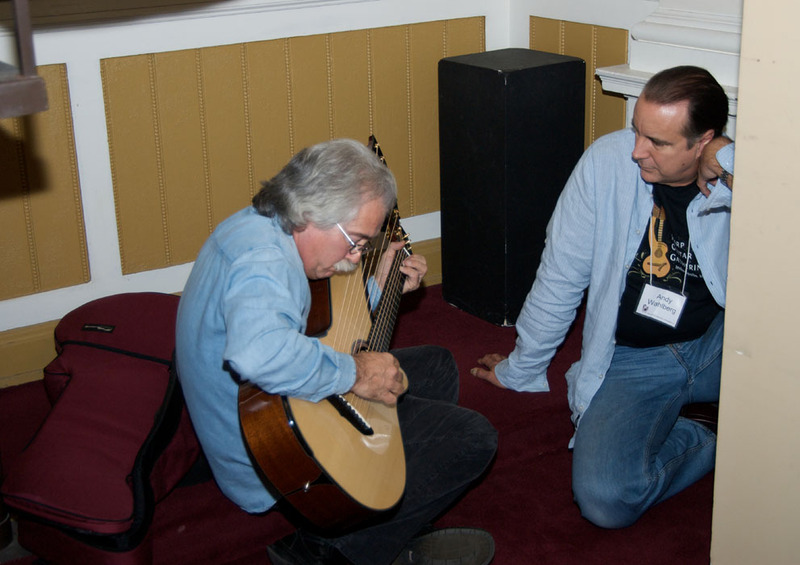 If anyone out there is currently working on a new harp guitar creation, why not plan for an unveiling at the Gathering? Next year’s event is already scheduled for Columbus Day weekend in Connecticut.